This is the fourteenth in this series of 26 posts, one for each letter of the alphabet, that I am writing during the Blogging from A to Z Challenge, April 2016. You can find all the posts, as they are published throughout the month, by following the A-to-Z April 2016 tag. N is for the Nage/Uke relationship. In a typical Aikido class the instructor demonstrates a technique, and then we pair off to practice it with a partner. The partner who responds to the attack and executes the technique is the nage (NAH-gay), or one who throws. The partner who provides the attack, and then receives the technique – that is, falls, gets thrown, or is pinned – is the uke [OOH-kay], literally one who receives. We switch roles back and forth as we train – acting as Nage and Uke in turn – so we can practice both sides of the interaction. First, I attack you a couple of times, and you practice doing the technique. Then you attack me. Nage – One who throws. Nage’s role is easy to understand. Our partner grabs our wrist or shoulder, throws a punch at our gut, or aims a strike at our head, and we do something about it. Usually that something is a combination of moves. First, we get out of the way of the attack so we don’t get hit, or so the grab doesn’t affect us so much. Second, we deal with the attacker in some way – throwing or pinning them. That’s usually what people first think of when they imagine what “learning to do Aikido” entails. They picture being Nage – defending themselves, and hurling their attacker to the ground. But it’s only half the equation – if that. Uke – One who receives. The part of Aikido that Uke does – attacking and then receiving the technique – is called ukemi [ooh-KEHM-ee], or the art of receiving. On the most basic level, it makes sense that in order for you to practice responding to an attack, you are going to need someone to attack you. In that sense Uke is like a pitcher tossing balls to someone who is learning to swing a bat. I grab you, or throw a punch at you, so you can practice doing Aikido techniques. Simple. If you were pitching balls to a friend, you would adjust the speed and complexity of the pitch to be appropriate to your friend’s level. If you were playing with your 7 year old neighbor kid you’d lob nice, slow, consistent pitches right into the middle of their strike zone. You wouldn’t hurl your best fast ball, and then celebrate when they missed it. You are trying to help your friend develop their batting skills. As your friend gains skill and confidence you can increase the speed, and start offering more challenging kinds of pitches. In the same way, if you were a brand new white belt, I would give you nice, easy, predictable strikes, or calm grabs from a standstill. Later we’ll get to running at you while shouting, grabbing you from behind, swinging full-speed at your head, or punching like I mean to go right through you. And maybe some buddies will join me in attacking you, too. And by then you’ll be able to handle that, and you’ll think it’s great fun, chucking us across the room as hard and fast as we came at you. Later. But ukemi involves more than just attacking, and then falling or rolling. Here’s where it gets a little more subtle. I give you a good attack to work with, and then I also participate in the technique you do in response. I don’t just turn to a sack of potatoes, waiting passively for you to do something to me. That’s a victim thing. Or worse, make your life difficult while you try to execute the technique. That would be like pitching a ball to you, and then grabbing the bat so you couldn’t hit it. Instead, I actively move with you, supporting you in learning to do the technique well. In my experience, there is at least as much to be gained from learning to be a good uke. As Goldberg Sensei says, “Uke isn’t just waiting their turn, they are doing Aikido too.” Both sides of the partnership are integral to Aikido training. Aikido is just as much about ukemi as it is about learning to deal with the attack and do the technique. Sensei gave us a beautiful image for this a few weeks ago: a simple curve. One side is convex and the other concave – yang and yin. We cannot have one without the other. They are two inseparable sides of the same shape. Nage and Uke are like this – it takes both to do Aikido. Good ukemi requires us to feel what’s happening and go with it. That means if we attack, and our partner slips out of the way, whirling us around to the left, we should actively participate in going around to the left with them. It’s a really difficult concept to grasp, even after months or years of training. Even more difficult to embody. We’re so used to fighting back! But resistance isn’t just futile, it’s counterproductive. If we are denying or fighting against what’s happening to us, then we cannot join with the direction of the energy and find a way to work with it. Worse yet, if we are acting on our thoughts about it rather than being present, feeling our way through, and responding to the actual situation, then our actions will be completely inappropriate. It’s a little like whitewater kayaking. Suppose I mysteriously find myself in a kayak, zooming down some rapids. There are a few options available to me. I could resist for all I’m worth, planting my paddle in the sand, paddling backwards, trying to stop or go back the way I came. That’s going to take a lot of effort, and I will likely end up exhausted and capsized. I could deny that it’s actually happening, throw my paddle at a passing tree in a fit of frustration, cover my eyes, and curl up in a ball. That will probably get me wedged between some very big, very wet rocks. Or, I could paddle with the current, moving into the flow, zipping between the rocks, along with the water. And as I went I could begin to assess my situation, noticing the where the calmer parts are along the edges, and work my way safely to shore when I see an opportunity. This last option is obviously the one we want to choose in kayaking. It’s less obvious when someone is bodily moving us in a direction we hadn’t planned for, but just as advantageous. If we can go with the movement, and stay calm enough to pay attention, we can find opportunities to arrange for a good outcome. In Aikido this can mean receiving the technique safely by falling or rolling smoothly out of it. 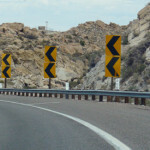 It can also mean being able to feel our way into even better options, including those where our partner ends up being the one who falls or rolls out of our technique. If we are fighting, resisting, or denying, these better alternatives aren’t available to us. Here’s the really tricky part to wrap your head around: It is through practicing ukemi – learning to feel what’s happening and to go with it – that we learn to be a better nage. As Chetan Prakash Sensei, of Redlands Aikikai, taught once during a seminar, if we can’t receive the energy of the attack, how can we respond to it and use it? Aikido relies not on fighting with incoming energy, but on actively getting behind it and helping it along. In this way, Nage and Uke are inseparable, each developing crucial skills, and both responsible for creating beautiful Aikido together as partners. In Aikido, we train to be both nage (like the rider – connected, clearly directing the horse in a way that doesn’t elicit confusion or a fight) and uke (like the horse – light, responsive, moving, centered, with no resistance to the rider’s direction). This classic video of Stacy Westfall’s nearly legendary ride demonstrates both beautifully. And it’s a beautiful song, too. To the unitiated, it looks like she’s “just sitting there,” but she’s controlling every movement – it’s just really subtle. Just the names conjure up tension. I have fun practicing them, and am improving (softer/safer). But I also end up with some interesting bruises and sore spots now and then, from doing them in a slappy, braced, breath-holding, brute-force-ish kind of way. Huh… I think I like that idea! Thinking of them as “low falls” takes a little of the edge off, and is a handy reminder that the idea is to get low, not high. I think I’ll call them low falls from now on. There is a very good discussion on the AikiWeb forums, about uke collusion in practice/training. It’s particularly relevant for me, because I will be participating in the Aikido Bridge seminar later this week, where Ikeda Sensei will be teaching, and where there will be lots of opportunities for refining my own ukemi, and observing the ukemi of others. One of the comments there, about how professional athletes train, brought something to mind: In horseback riding the relationship between the rider and the horse is very much like the relationship between Nage and Uke. The rider (Nage), through their cues, posture, weight shifts, placement of attention, and so on, is able to affect the balance and motion of the horse (Uke). It should not be a battle – it should be a partnership. They are not in opposition. Horse training essentially is training the horse to be a good uke – sensitive, not reactive, not anticipating, but moving as directed when the rider makes a request correctly. Of course, beginning riders are hopelessly uncoordinated about their weight, center, attention, posture, hands, feet, etc. A horse that refuses to budge, or who can’t understand what is being asked, would only frustrate them. Thankfully there are talented, experienced, angelic horses referred to as “schoolmasters” who and understand, and who happily play along with these fumbling newbies. A good schoolmaster lets the rider get the feeling of what a correct trot, balanced halt, or smooth canter depart should feel like, even when the rider doesn’t know how to ask perfectly yet. These horses, bless their hearts, can also perceive the skill level of their riders. While they may jog along sweetly for a little kid flopping around on their first ride, they may just as well require quite correct riding from someone more advanced. In essence, the schoolmaster colludes, but only as much as is appropriate for the level of the rider. Pretty amazing ability, for a horse, but they do it regularly. My understanding is that a good uke should provide that same kind of feedback to Nage. With a beginner, one may have to essentially guide them through the motion at first, by doing the ukemi as though Nage had performed the technique correctly, even if Nage didn’t really have their center, or didn’t take their balance. With a more advanced nage, feedback more along the lines of “Nope, I ain’t goin’, you don’t have me” might be more appropriate. Of course, there are good-natured, willing horses who simply do not understand, perhaps through lack of experience, what the rider is trying to ask. And there are others who know exactly what the student is requesting of them, but who have a “betcha can’t make me” attitude. The former may grow into happy and useful schoolmasters with experience. The latter will likely end up paired with riders who have similarly been trained in the “make ‘em mind you” philosophy of horsemanship, where force, conflict, and opposition are just the way things are done. As a human uke, I’d sure rather work toward being more like the schoolmaster. One of the yudansha who teaches at our dojo, Cyril, uses a variety of people as Uke when he demonstrates techniques. It makes classes that much more intense, because you never know when or if you’ll be called up, so you’d best pay sharp attention. Learning to be a good uke is really important to me, for a lot of reasons. 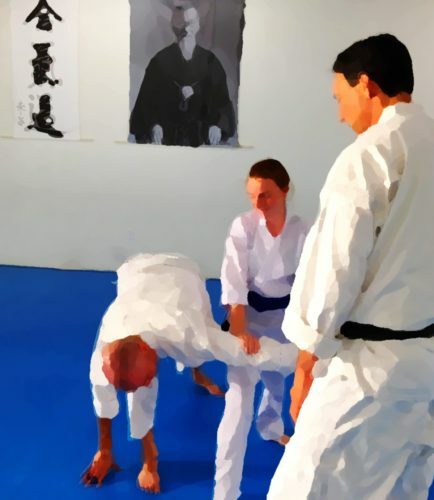 A lot of the most valuable learning in Aikido comes from ukemi. Like learning to move with and into the energy and situation, rather than fighting against it, for instance, not as a way of giving up, but to keep one’s center and regain balance. Being a good uke isn’t just falling, it includes providing committed attacks so one’s partner can practice effectively. Ukemi seems to be where I find growth and discovery happening, more than in practicing techniques as Nage. So I’m grateful every time I’m called up to help demonstrate a technique. Even when (and it seems to be the case more often than not) I screw it up in some spectacular way, and have to be shown what was wanted. Although he is incredibly gracious about it, I hate being incompetent. Crawling under a rock has sounded like a good plan on a few occasions. I learned early on, however, that abject humiliation, even in front of the whole class, will not kill me. The only thing to do is shake it off, note the correction, focus, and do better the next time. If I pay close enough attention to how he gently guides and redirects students it could help me become a better teacher, and better person, too. This is a quick post about today’s classes. Tomorrow I’ll put down some thoughts about the whole 16 days. There were 2 classes today: Weapons, and open hand. In the weapons class we did the first 10 jo suburi. I think I’d done them all before, but at any rate none were a mystery, so I was able to focus on doing them correctly. I need to work on my timing. I was coming in ahead of the strike, which isn’t a terribly good idea. I’m feeling pretty good about most of the jo techniques I’ve learned. I’m sure they are very crude at this point, but I think I have the concepts down enough to practice a bit on my own, and recognize at least some of the things I might be doing wrong. In the second class we worked mostly (entirely?) on preparing to do breakfalls. (Yay! Something I have done nearly none of before today.) Not exactly like this video shows, but that’s the idea. I was with a group doing really easy, low stuff (like early in that video), while most of the class did more advance practice (like later in that video). Even the “easy” stuff feels really awkward and scary at first! Like “no way, I’ll die.” LOL But by the end of class it was feeling much more natural. It’s not that I’m in any hurry to be doing spectacular high falls, but I feel a little “at risk” not knowing the basics. Like driving a car without knowing where the brakes are. So I was really glad to start working on this a little. More tomorrow about the whole experience of my 16-day “Personal Aikido Intensive” experiment.